Out of my boredomness, this idea popped out of my silly head, just to create an income opportunity for myself and people around; whoever want to work with me to cut and sell the meat. So far there were a few people interested. So earlier today, I squeezed my head to create such a simple flyer, print it out, fotocopied it, get the mosque administrative people to approve and then I put all my flyers at the mosque, so people would be able to at least have a peek on it when they're going to the mosque for prayers. It's going to be Raya so i guess people would be highly in need of meat, for rendang, soups or whatever. 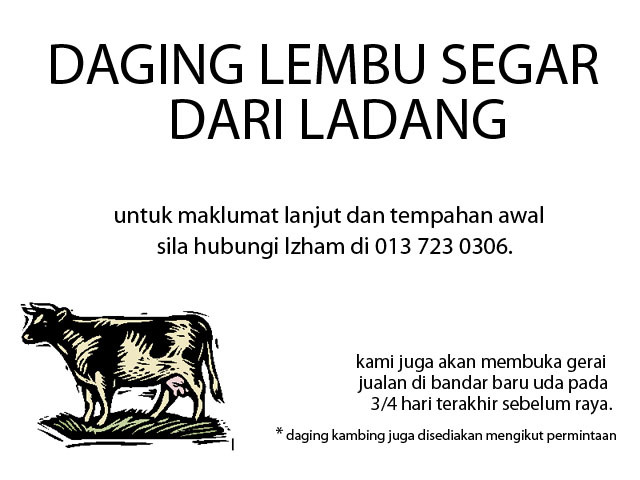 Anyway, this offer is limited to people in JOHOR BAHRU only...! So okay, since i'm trying to sell meat today, I think i'm gonna share a pretty simple meat based recipe, the turmeric fried beef (daging goreng kunyit). Nyum nyum... then, pour in all the chopped meat into the frying pan. Using the minimum heat, the chopped meat is boiled to tender. Do you know how? You know or not? Hehehe. Use the fork and press it down of course. Depending on your taste, pick the tenderness that suits you. If you have a lot of old folks in you house, you might cosider boiling it for about 40 to 60 minutes, depending on the type of meat you're using. Ensure to water up the meat if it's drying up before it's really tender. Otherwise you might end up sending the choking old folks to the hospital, instead of going to the Solat Tarawikh. * Make sure no one is around and not fasting, sneeking and stealing from your pan. At the end of the day, there'snothing left for you. While waiting for meat to tender, slice the onions together with RHCP, and also the spring onions. Once it's tender, then pour in the cooking oil, and if possible, use the olive oil + garlic oil, just to give it the garlic taste without you having to deal with the garlic. As for me, the garlic scent will stick to my fingers for days! Fry the meat, and pour in a spoon or two of the turmeric powder. Depending on how you want it to be. Mix them well. Of course, once the meat is starting to stick on the pan, put it the onions and RHCP. Mix them well again and pour in the oyster sauce. Mix, mix, mix, lastly you put in the chopped srping onions. Good to be enjoyed with rice, fresh petai for ulam and iced syrup for berbuka puasa. Have fun!